I previously entered my first sketchbook for the project several years ago, 2010 I think. New to the idea and naive about the materials I was using I dived in. It seemed that my inexperience and naivety was no obstacle to joining in. The first sketchbook was heavy on colour and acrylic paints. Looking back I suspect the pages had all stuck together fairly soon. My sketchbook had also been digitised and yes, I got comments. People not only looked at my little beginners sketchbook but they left me a comment to say they liked it. People who didn’t know me! My self doubting, zero-confidence, private, artist self was finding her feet. Fast forward a few years, my life looks very different and I’m not hiding my art or my desire to make it any more. 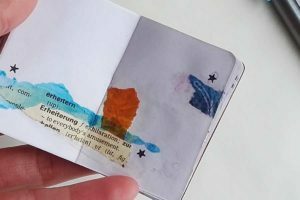 I see a post about The Sketchbook Project and decide to take part in 2019 and then I hear about the Tiny Sketchbook Project. The sketchbooks are gathered up into a mobile library and tour. The main sketchbook project tours USA and people can checkout the books, just like a regular library. The Tiny Sketchbook Tour is coming to London. This means I can visit my sketchbook on the tour too! 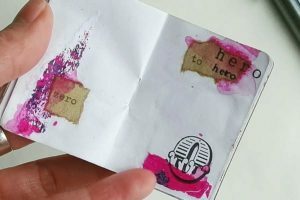 The Tiny Sketchbook is a fantastic creative exercise and I recommend it. Posting back to Brooklyn Art Library as I have a terrible fear of my parcels never arriving! The additional cost of digitising the sketchbook is not small but it’s really worth doing. I didn’t this time, and I wish I had. Working in a new way, that is, very tiny, did get me thinking about new things while I was working on it. I did grab some canvases and start layering collage as a direct response to a sketchbook spread. 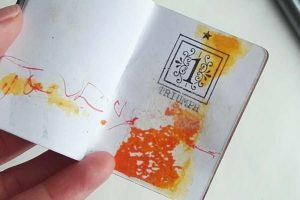 Ideas for themes, composition and colour can all be explored in the sketchbook, just like in an art journal. I took the theme and the focus of some of the pages and began to plan a series around them. Words I used in the pages such as triumph and rise became the seeds for a painting. This tiny sketchbook is now on it’s way to Brooklyn Art Library. I do have another sketchbook to complete although this one is full size! In the meantime I have a pile of canvases waiting my attention. I’ve been inspired to explore some new ways of using Powertex textures in my art so I have some experiments to do! 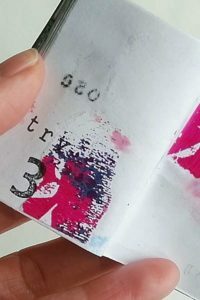 You can read more about my art journals and journaling process here.